The Camanche Road Bridge (26C0012) crosses Jackson Creek about a mile west of yesterday's bridge. 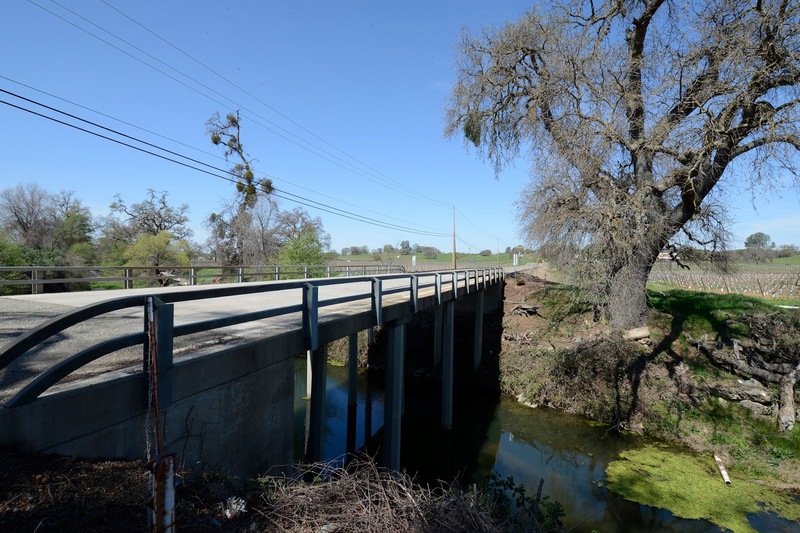 It is a four span continuous cast-in-place reinforced concrete slab bridge built in 1976. The slab is supported on hexagonal pile extensions with drop bent caps and on end-diaphragm abutments. The bridge is 87 ft long, 28 ft wide, and with a 10 degree skew. It carries about 1800 vehicles a day and has a sufficiency rating of 81. The creek looks wider here but the banks are beginning to slump and there is some concern of scour around the piles during spring floods. At work, we are trying to develop details to use more ductile pile extensions to support slab bridges for earthquakes. However, the standard slab details don't have enough reinforcement to force plastic hinging in the pile extensions. 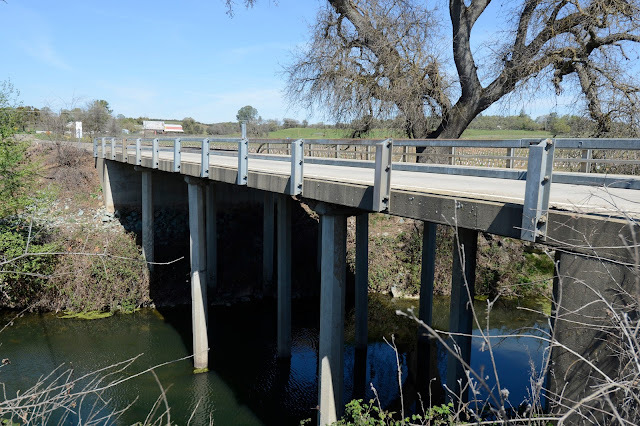 Amador County, California Bridges: Camanche Road Bridge across Jackson Creek by Mark Yashinsky is licensed under a Creative Commons Attribution-NonCommercial-ShareAlike 3.0 United States License.